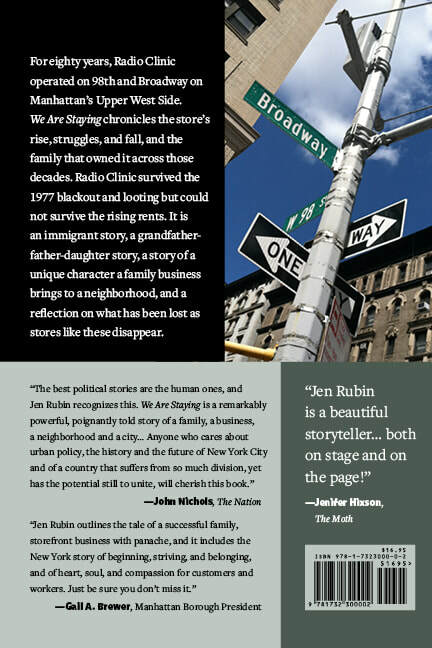 For eighty years, a store named Radio Clinic* stood on the 98th Street block of Broadway on Manhattan’s Upper West Side. My immigrant grandfather opened it in 1934 during the depths of the Depression as a radio repair shop. To distinguish his shop from his many nearby competitors in those early days of radio, he sat fixing radios in the storefront window – visible to the public in his “clinic” -- wearing a white doctor’s lab coat. The business grew over the decades to sell radios, televisions, appliances big and small, electronics, and air conditioners, lots and lots of air conditioners. 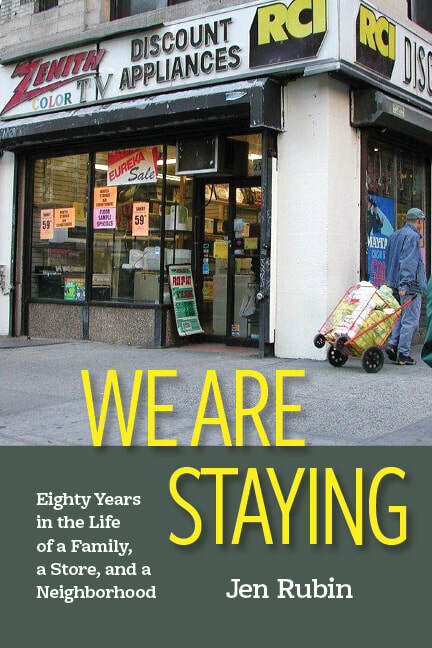 My book, We Are Staying: Eighty Years in the Life of a Family, a Store, and a Neighborhood, tells about the rise , struggles, and fall, and the family that owned it across those decades. It is a small business story and a story about a shop owner that keeps on going despite the odds. It is an immigrant story, a grandfather-father-daughter story, a story of the unique character a family business brings to a neighborhood, and a reflection on what has been lost as stores like these disappear. Reviewed by James Goodman in the Progressive magazine. Mentioned by the former Manhattan Borough President in a hearing about NYC small businesses. My New York Times Op Ed about Radio Clinic. Part of Radio Clinic's story can be found in Kevin Baker's essay, The Death of a Once Great City: The fall of New York and the urban crisis of affluence, published in Harper's Magazine. PBS American Experience featured Radio Clinic in its documentary about the Blackout. Check out my guest blogpost on clearing the writing hurdles to publication. George Vescey, former New York Times Sports of the Times columnist describes my book in a blogpost.